We spent 9 days in Santa Cruz, taking advantage of a vibrant, typically Spanish city (without the tourist mayhem) and its more sophisticated and quirky shops (great chandleries and building supplies!) with a small tropical oasis of birdsong, fountains and greenery in its centre. Days spent doing yet more boat work, clearing smelly flying squid who had landed in the dinghy, and died there, scrubbing black squid ink from the side of the hulls (where obviously a squadron of squids attacked Talulah on our sail to Santa Cruz! ), sorting administrative nightmares, cycling around town (we bought some cheap aluminium fold-up bicycles, oh joy!) and making some wonderful friends with other boats on our pontoon. All French. So evenings spent having “aperitifs” with Thierry & Marine (“Sun Tenareze”), Jean-Luc & Dany (“Castafiore”), and Michel & Florence (“Flo”). Tenerife was hit by some terrible storms during this time, and it rained most days, roads and cars being swept away. Yesterday, Thursday 26th, we hired a battered old car and drove around the island, through Parque Nacional Del Teide, and finally made it up the 3718m volcano! 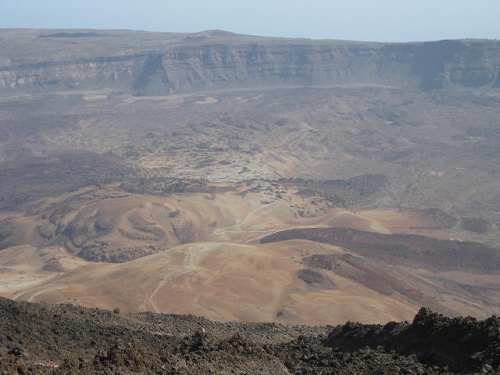 The views form the top were stunning with the volcanic valley spreading out majestically below. We were both a little cold and light-headed at the peak – oxygen is a little shorter up there than at water-level! The national park is amazing - full of rough badlands (deeply eroded barren areas), smooth pahoehoe lava (looks like twisted taffy) and pebble-like lapilli, with volcanic pipes and cones, and the occasional steaming hole (where if you put your hand inside, its surprisingly warm). We then drove through beautiful pine forests and varying vegetation in the north. The day ended with a 3 hour supermarket stock-up, so Talulah is now stuffed with water, cans and rice in every nook and cranny, and is sitting a tad lower in the water. (And we still haven’t bought fresh produce yet for the 3 week (?) crossing (but you need to stock up for 6 weeks incase…). We are looking to set off in the next 3 days, will keep you posted! So this is what they mean when they talk about a craggy landscape! 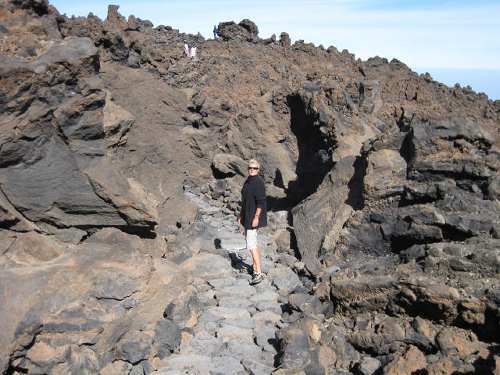 Ali hiking through the lava up El Teide, Teneriffe. It’s a long way down. 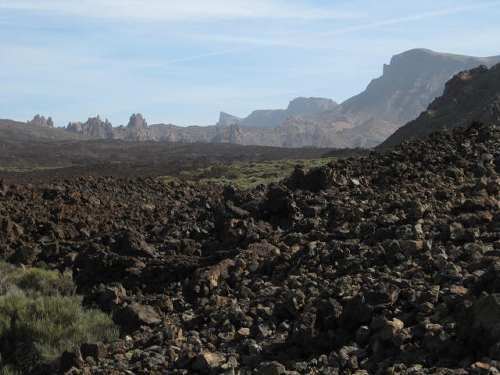 The valley below El Teide. More dramatic landscape, but safely down again.